Your Global Entry card also works to let leave your shoes on at many TSA lines. (See info below, however. You have to register your new status with all your airlines’ frequent flyer programs.) Combined with leaving your computer and mouthwash in your bag, that can be a big time saver. I haven’t had the chance to use it yet for return to the United States, but I’m looking forward to breezing by the lines at United States Immigration with my new Global Entry status. Update: I now have used it for two entries into the US, in Honolulu and at JFK. It works just as advertised. Easy. Here’s how it works. In most points of entry at US airports, there are electronic kiosks where you insert your passport, scan your fingerprints, and answer a brief customs declaration questionnaire about anything you might be bringing into the country. The kiosk prints out a receipt which you display as you go through the special Global Entry line. Unless you are issued a receipt with an X, you should be able to go through without stopping. An X might be issued as a random security check, or because of your customs declaration. The process for getting your Global Entry Trusted Traveler status is fairly simple. You apply online via this web site. It’s a fairly extensive questionnaire, and you need to have your passport and driver’s license handy to complete it. Before you log on, you might also make a list of all the countries you have traveled to in the last five years, because they will ask you that. Also, you’ll need accurate information on your addresses for the past ten years. By the way, the application costs a non-refundable $100, which you can pay by credit card, so you should review the eligibility requirements before you ante up. Once you’ve successfully filled out this questionnaire, (and, they’ll remind you when you get to the end if you’ve missed anything) you’ll go into an approval queue. It took about ten days for me to receive notification via email that my application status had changed. At that point, you have to re-login to the Global Entry application site to check your messages. My message was that my application had received preliminary approval and I had to schedule a personal interview to complete the process. At the site, you are offered locations for your personal interview. These are usually Homeland Security Department offices at major US international airports. The waiting time to get a personal interview varies, but it seems to be scheduling out as long as a month or two, so make your appointment as soon as possible. The interview itself is relatively painless…or as painless as being interviewed by a uniformed Homeland Security agent who has a gun on his hip can be. My interviewer was a courteous young man who asked me a few questions about my work, what traveling I’ve done, what were my favorite countries to visit, and so forth. My guess is the answers didn’t matter as much as his watching me for signs of any evasions. I got the feeling after it was done that this officer really knew his business and his apparent youth was a clever disguise for someone who was exceptionally competent. Honestly, I felt better after the interview that such people are on the job. After the interview, he took my fingerprints and submitted them via computer to some database in the cloud and within a couple of minutes, he told me I had been approved and could begin using the program immediately. He then took me over to a demonstration kiosk and showed me how the kiosk worked. The whole process took about twenty minutes. He also told me a Global Entry ID card would be mailed to me within two weeks. (It actually took only one.) The card is an extra benefit of the Global Entry program and allows you to undergo expedited screening at US airports. What this means, basically, is that you sometimes get your own screening line, and you don’t have to remove your belt, shoes, liquids and laptop. I’m really looking forward to that. After you receive your card, btw, you have to go back to the Global Entry site yet again to register it. I will be nice and wait for her on the other side of the ropes. Here are some helpful FAQs on the process and eligibility. And here are the places where you can have your Global Entry personal interview. I don’t take off my shoes, jacket, or coat since they made that nice rule about old people. Just watch out for terrorists over 70, though. Yeah, we’re not quite there yet. Soon, though. I just applied and have an appointment. It’s good to know what to expect, and it’s also good to know I’ll need to update all my frequent flyer profiles. I had thought “the system” would automagically know if you have a Trusted Traveler number, but I guess it goes through frequent flyer programs. But what if you fly on an airline where you aren’t a member of their program — do reservation systems allow you to enter your Trusted Traveler number? Max, I’m not exactly sure if you have to join the frequent flyer program in order to use your Trusted Traveler status. I do know, however, that some airlines do not support TSAPre/Trusted Traveler (damn you Frontier) and even if you have your Trusted Traveler ID card with you, if the airline hasn’t printed TSAPre on your boarding pass, you’re out of luck. Then there’s Omaha, where we’ve been flying from recently. They have two concourses. The Frontier concourse does have a TSAPre line, but it’s no good because Frontier doesn’t support it. The United concourse doesn’t have TSAPre. Your government at work. Great tips. I should be applying for that but the issue is when you trave with your family with toddlers and strollers I really don’t think this will help us go through. Even though it’s hard to deal with immigration when you try to get out of the customs. Nothing is done to ease up the process with small child. Do you think they approve by family or each family member even the toddlers should apply for it ? My wife and I had to apply separately. Not sure what the procedure is for young children. 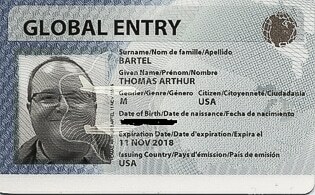 http://www.cbp.gov/travel/trusted-traveler-programs/global-entry/frequently-asked-questions has some answers, although I can’t find whether there’s a minimum age requirement to get Global Entry. It does say everyone in a traveling party has to have their own GE status, though. Actually, just found this on the FAQ page: Are children able to enroll in Global Entry? Yes. Children may enroll in Global Entry. Minor children 18 years or younger are required to have parental or legal guardianship permission. I have an American Express Platinum card, and the $100 fee was refunded after I paid using the card and my application was approved. Perhaps there are other credit cards out there with similar rebate programs?